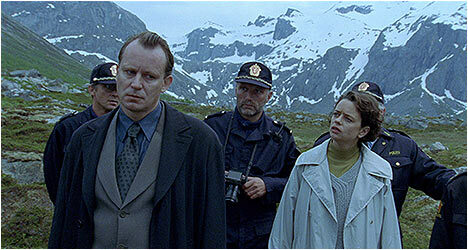 In retrospect, films like Smilla’s Sense of Snow (1997) and Insomnia (1997) anticipated the recent fascination with Scandinavian thrillers. While the former dealt with a protagonist uncovering the nefarious machinations of a powerful corporation under the guise of an engrossing mystery, the latter cranked it up a notch with a deeply flawed protagonist and a case steeped in sexual deviancy. Senior investigator Jonas Engstrom (Skarsgard) and his partner Erik Vik (Ousdal) are brought in to investigate the murder of a 17-year-old girl in the Norwegian town of Tromso. There are hints early on that Engstrom left his native Sweden in disgrace and now works in Norway. The two men arrive at a time of the year when the northern town has no real night and Engstrom has trouble adjusting. The ensuing insomnia and his own psychological flaws begin to affect his work. What’s interesting about Insomnia is that the killer’s identity is revealed fairly early on and then the film shifts its focus to the deteriorating psyche of Engstrom, which is expertly conveyed by Stellan Skarsgard. He is an actor not afraid to play flawed characters with their own unique psychological aberrations and he has certainly played his share of unsettling people. Insomnia continues his fascination with such characters, but it is notable for how well and fearlessly he depicts Engstrom’s internal conflict. Director Erik Skjoldbjaerg doesn’t skimp on the thriller aspects as evident in a scene where Engstrom and Vik orchestrate a stakeout in the hopes of catching the killer. They end up pursuing him through the fog-enshrouded countryside. It’s a nicely choreographed scene and one in which its outcome complicates Engstrom’s life even more, haunting him for the rest of the film. In 2002, Christopher Nolan directed the American remake, which predictably jettisoned some of the ambiguity of Engstrom’s backstory and motivations, which makes it inferior to the original. Insomnia helped kickstart a new wave of “Nordic noir” spearheaded by the novels of Henning Mankell and Stieg Larsson whose The Girl with the Dragon Tattoo has been adapted into a film on two separate occasions. Insomnia takes a fascinating journey into the mind of a disturbing protagonist, whose corruption runs deep, blurring the line between him and the killer. This new Blu-Ray upgrade is a considerable improvement over the previous DVD edition with more detail noticeable and features a brighter look. New to this edition is an engrossing conversation between director Erik Skjoldbjaerg and his leading man Stellan Skarsgard that runs 20 minutes. They jump right in and talk about the film’s origins, which came out of Skjoldbjaerg’s time in film school. They talk about meeting for the first time and Skarsgard offers his initial impressions of the screenplay, which he didn’t like. This is engaging conversation as the two men reminisce about making Insomnia. Also new inclusions are two of Skjoldbjaerg’s short films, which he made while attending the National Film and Television School in London. Finally, there is a trailer, carried over from the previous edition.